So I've had way too much exposure to Mass Effect 2 lately (yeah, I know I'm way behind. I've owned it for ever but I finally have a computer that can handle it). Awesome game, for the most part. Funny characters, entertaining action... a few pretty dull and laborious missions, but well written for the most part. Anyway, it's full of brilliant design from alien races to spaceships to environments. 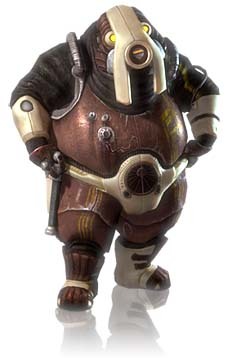 One of the alien races is the Volus - they all pretty much seem like the needy, insecure type with obnoxious inferiority complexes... for some reason they remind me of a bunch of short, fat, fanatical baptist preachers. I have no idea why.